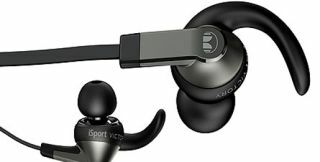 UK prices confirmed for new Monster iSport earphone range ahead of London Marathon Expo showcase | What Hi-Fi? Monster has confirmed UK pricing for the latest models in its iSport earphone range, which is to be featured at the annual Virgin London Marathon Exhibition next week, ahead of the race itself on Sunday April 21st. Designed for both beginners and serious distance runners, the iSport range comprises the flagship iSport Victory (£130), iSport Intensity (£80) and entry-level iSport Strive (£60), plus the blue iSport Immersion (£130). The Virgin London Marathon Exhbition runs from April 17th until to the day before the big event at ExCel in London's Docklands. For more information visit the show website. Monster is expanding its iSport range of headphones with three new in-ear models designed for athletic types. Al three models are sweatproof and waterproof, which is handy. The new flagship earphones are the inspiringly-named iSport Victory, and are joined by the iSport Intensity and the entry-level iSport Strive. We're almost tired just reading the names. The iSport Victory (above) claims a new and improved ear-hook design and new tips for a more flexible fit. The iSport Intensity (below) meanwhile claims to be "the first Monster in-ear headphone designed to allow users to hear some ambient noise while sealing in 100% of the music". Monster claims this makes them much safer for active use - runners and cyclists can hear external noise despite sealing in all that music. We shall see. The Strive is the entry-level model meanwhile, and alongside a new design also comes with the Control Talk Universal in-line remote, promising "play/pause for most media players and smartphones". Try before you buy on that one, though. These new models join "the existing iSport Immersion in the Monster line". There's no mention of the yellow models with the LiveStrong branding – synonomous with Lance Armstrong, though no longer connected to the cyclist. Available at the end of February 2013, pricing has not been set for the new Monster iSport headphones.